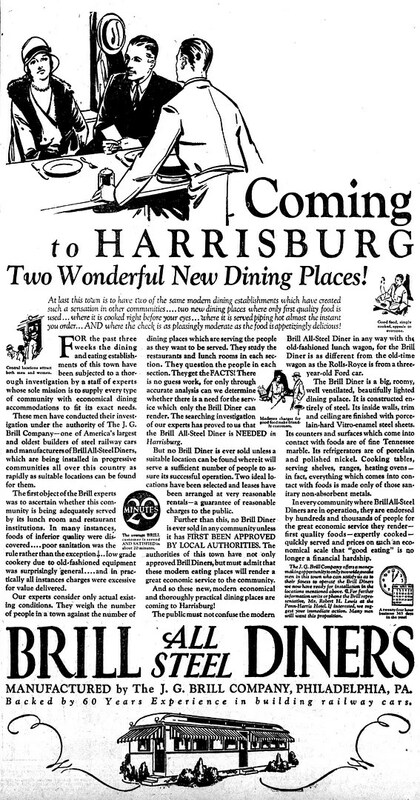 A Brill Steel Diner arrived in Harrisburg, PA on July 1, 1929 from the factory in Springfield, MA. Its installation was supervised by Robert H. Lewis of the J.G. Brill Co., who had been in Harrisburg on a sales trip in March of 1929. It was originally set up at 329 Walnut Street and cost $12,500. The diner was owned by Robert B. Brown of 259 Seneca Street, who had previously owned diners in Philadelphia. He operated the diner from 1929 until his suicide in 1933. His widow, Gertrude Brown, took over the diner and ran it until 1940, when the YMCA expanded their building onto the site and the diner was forced to move. The newspapers and directories have a bit of confusion about the name. 1929, 1930, 1931 have it listed as the DeLuxe Diner. 1930 has the DeLite Diner at 239 Walnut. In 1933, the DeLite diner shows up at 325 Walnut Street, listed in the directory alongside the DeLuxe, still at 329 Walnut. Later, the DeLuxe Disappears from the listings and the DeLite begins to be listed at 329. Articles about the removal of the diner for the YMCA expansion alternately refer to it as the DeLuxe and the DeLite. “Deluxe” was a standard name for Brill Diners of the period.